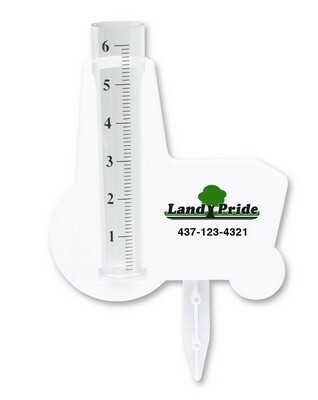 Read and measure rainfall events quickly and easily with this Tractor Rain Gauge. This rain gauge is made of weather proof clear acrylic that enables you to accurately measure the rainfall. Read and measure rainfall events quickly and easily with this Tractor Rain Gauge. This rain gauge is made of weather proof clear acrylic that enables you to accurately measure the rainfall. The gauge holds up to 6 inches of rain. This Tractor Shape rain gauge is a novel farm and lawn accessory. It also provides a large area for printing your real estate, farm equipment and services advertisements. Imprint your corporate logo and message on this great promotional item and promote your branding in classic style!